DAY 1. It’s official–the horse is here, there’s no turning back! He’s confident in a new environment. He has a great trot. He’s healthy, sound, and has had excellent care his entire life. He is mentally present and ready to learn. He already communicates openly with people and is curious of his surroundings (“is the feed pan a toy for me?!?”). Some off-the-track-thoroughbreds can be a bit withdrawn and may need help learning to be a “regular horse” again, but not this guy! Prodigious. Photo © Reed Palmer Photography. This morning I took off time from work and got up early (oh so early) to drive to Oak Crest Farm in Enumclaw. Oak Crest Farm is BEAUTIFUL–truly a horse paradise. There I met Solar’s owners/breeders–Jack and Theresa Hodge–and also a celebrity–the ex-racehorse Prodigious! 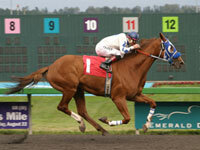 Prodigious is the horse that inspired Emerald Downs’ Prodigious Fund, which began in 2008 to raise funds for ex-racehorses and now is hosting the 100-Day Trainer Challenge. At 15 years old, Prodigious looks super and seems to be enjoying retirement. Solar was a peach in the trailer during the 1 hr. 45 min. drive to Nayborly Farms in Tenino. It was 80 degrees and HUMID, so I was pleased that he didn’t get overly worked up in there (thank goodness, because I was overly worked up trying to navigate “the back way” home by myself!). He was slightly nervous about unloading since he’s used to trailers with ramps (ours has a step down about 18 inches high). I let him have a moment to look, and he jumped out with excellent coordination–maybe a career in three-day eventing is in his future? He settled right in to his paddock without any fuss and took to eating and drinking within a matter of minutes–high five for the well-adjusted traveler! At the end of the evening I did some roundpenning with him in his paddock with no halter. He’s a total buddy already and willingly follows without a lead. If anything, he could practice leaving me some more personal space (we’ll work on that). I was able to lift all 4 of his feet with no trouble as well as rub him allover his body–he clearly has had good handling in the past. He likes his tail scratched and the front of his face rubbed. I’m taking notes of his sweet spots so we can stay on good terms. Be sure to follow along here, or on my Youtube channel, and/or at my new Twitter account! Looking forward to watching the journey unfold! That is one lucky horse to have been chosen by you. You two are going to rock this challenge. No doubt! I got to meet him already (just saying, not bragging – much). 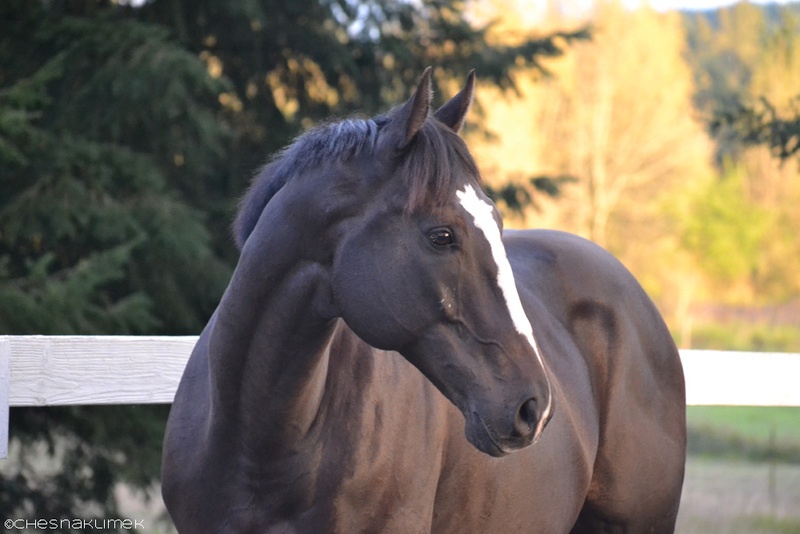 He’s everything a horse should be, which to me is friendly, calm, sweet tempered, and, (bonus), beautiful. Somebody is going to be truly lucky to have him. I’m looking forward to following him. so what do you do with them when they complete the training….are they sold, auctioned, given back to owner or? I know someone who could be interested in him when done…..and I am curious. He will Love Nayborly Farms…Carly did! Hi Marion! 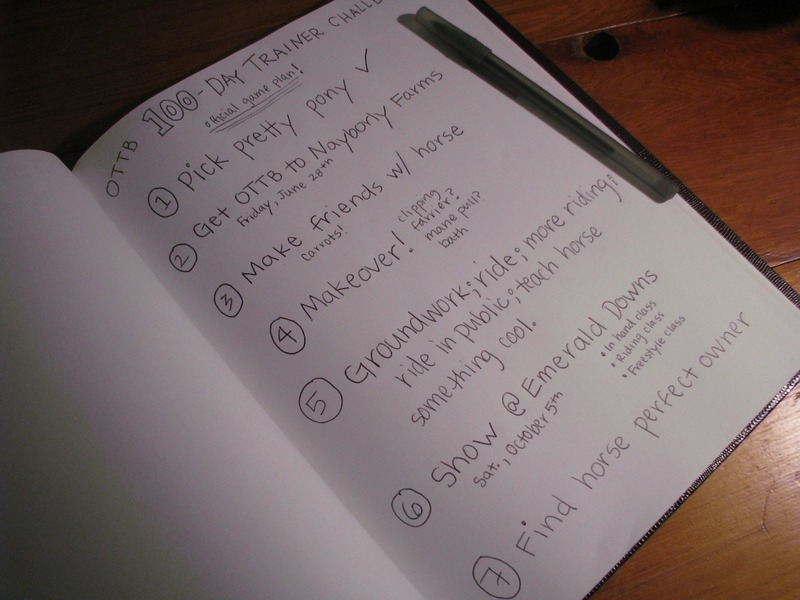 All of the horses participating in the 100-Day Challenge will be available for private sale. The goal is for the trainers to work with the owners to set a price and find buyers when the horses are ready. If the horses sell within a certain timeframe after the event, then the trainers can get a commission from the sale to help cover their training costs.